"Come, Christians, Join To Sing - Conductor's Score"
Composed by M.A. Charpentier. Arranged by Jan Mulder. Sacred. Conductor's score. With Text language: English. 10 pages. Published by John Miller Publishing (J2.6629). Key: Key of g. Text: Bateman. 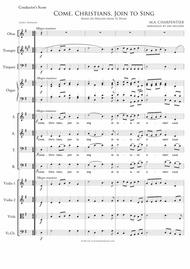 "The famous ""Te Deum"" By Marc-Antoine Charpentier (1645-1704), arranged by John Mulder, for Four-Part Voices (SATB) with Organ Accompaniment (organ version: #6628) and Optional Oboe (version: #6623) , Double Bass (version: #6624) Timpani (version: #6625), Trumpet (version: #6626), Cello (version: #6627), Viola (version: #6630) Violin 1 (version: #6631) and Violin 2 (version: #6632). Conductor's score (version: #6629) and full version (version: #6633).". Preview: "Come, Christians, Join To Sing - Conductor's Score"